We no longer have specific information about hardware we sell on our website. The industry changes too fast for our staff to be able to keep the pages up-to-date, and we decided that it was best to simply leave the stuff off the site. Please contact us via phone to talk about your company's needs. We can schedule an appointment for a free written IT assessment at your convience. From workstations to printers, from network switches to wireless adapters, we can assist with the selection of any hardware for your small office. We strive to recommend products that provide the best value to our customers in terms of price, maintenance and product life. We can assist you with selecting hardware and purchasing it directly for an hourly fee, or we can acquire and install the product for you. We recommend Dell or Lenovo PC products for their proven reliability and compatibility, but we can also build custom workstations or servers specifically designed for your business needs and your budget. Network wiring is still the norm for most business networks, and Indigo Computer has extensive experience in installation of network wiring in both existing and new buildings including concrete, brick, metal and wood frame structures. We can tailor the installation type to your work environment and your budget, for instance a warehouse generally has different installation needs than an executive office space. Wireless networking is on the minds of most businesses now. Wireless networking introduces a new set of issues when running certain sensitive network applications, and some applications simply won't tolerate a wireless connection. Whether its building to building bridging over a distance, or local area network wireless clients, Indigo Computer has the know-how to make sure your people will not have issues with their wireless devices. While wireless networking is seductive in its apparent simplicity, but if improperly implemented it can be the most vulnerable link in an organization's overall security plan. We can design, install and secure your wireless network and demonstrate that security to give you piece of mind. Indigo Computer can work with your company to select, configure and install a Dell Server that meets your needs and fits within your budget. Dell Servers are recommended since they are typically designed for years of service and a good price point for small to mid-sized businesses. For less robust server applications, Indigo Computer can design and build a custom server to meet the needs of the small office. Not in the pocket of Microsoft, we can work with installing Windows Workstation, Windows Server, or we can work with Novell, Linux, or Unix Server operating systems. We have Internet Security plans scaled from single PC home office users to large offices. Solutions include Antivirus, Antispyware and Internet behavior guidelines that will help keep your company from falling prey to Internet Threats. If your company does get a virus infection, Indigo Computer has extensive experience in onsite or in-our-office virus detection and removal. Data Backup is an often neglected procedure in small office and home office settings. We can help you develop a data backup plan that will safeguard your data and keep your business moving in the event of PC failure. Disaster Recovery plans are a must for any business. We can help you develop a written disaster recovery plan that you can use if the unspeakable happens. Contact us for more information on our disaster recovery plans and services. PC repair for all makes and models of IBM Compatible PCs. Onsite service available for most situations that will have you up and running in no time. Response times are typically same-day for current Indigo Computer customers. Software is quickly becoming the most costly part of Information Technology. As hardware becomes cheaper, software prices make up more and more of the IT budget for a company. We can purchase and install software your company needs on new or existing PCs. Looking to cut costs? Indigo Computer might be able to reduce some of that cost with excellent free or low cost software recommendations that replace the mainstream applications, yet provide full compatibility. 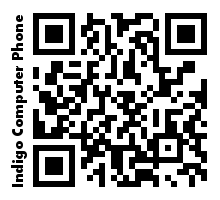 Indigo Computer can assist your business with their Information Technology. Contact us for complete information or to schedule a free IT assessment for your company.